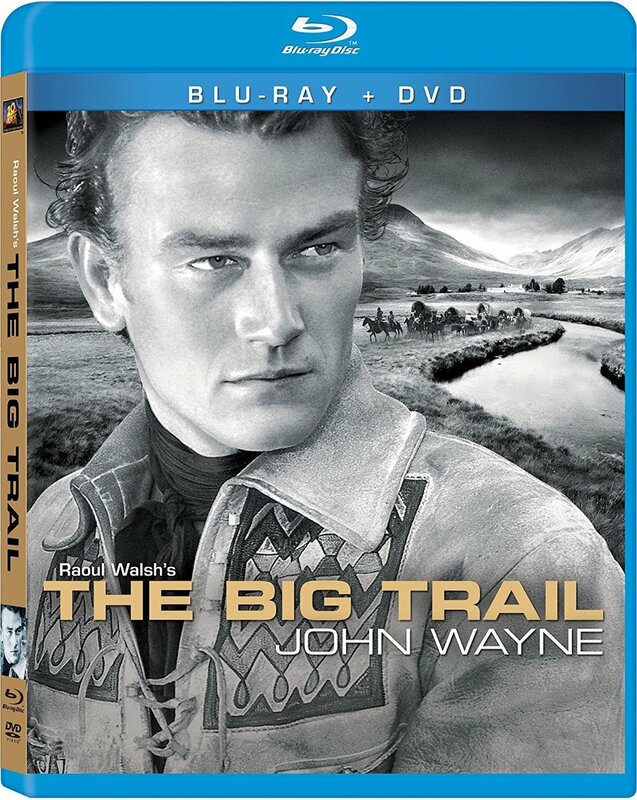 "The Big Trail" (1930), Blu-ray. A Fox release from 2012. Video on this one is 1080p/24, Black & White. Two distinct versions of the film are included, shot with separate cameras and edited differently. So there are differences in both shot angles and actual scenes. The primary feature is the Grandeur (70mm) release with an Aspect Ratio of 2.10:1. 2 hours 2 minutes long. Also included is the shorter, standard Academy (35mm) release with an Aspect Ratio of 1.2:1 (i.e., after reserving a portion along the edge of each frame for the optical sound track). Audio is DTS-HD MA 1.0 48kHz 24-bit. A Commentary track by Film Historian, Richard Schickle is available, but only while playing the Grandeur version. 1080i Extras -- all upscaled, SD content from the prior, SD-DVD release -- include a "making of" piece (13 minutes), a piece on Director Raoul Walsh (13 minutes), a piece on the early life and career of John Wayne (14 minutes), and a piece on the innovative, 70mm, "Grandeur" cinematography (12 minutes). The retail package also includes the SD-DVD release of the feature, including some still photo galleries. In the late 1920s, William Fox, owner of Fox Film Corporation, came up with his own, cunning scheme to take over the ENTIRE film industry. The future, as he saw it, would be widescreen filmmaking of sound films -- to be shot, "on location"! His marketing name for this new type of filmmaking would be, "Grandeur". He would film in 70mm, on location, using portable sound studios which he had built into trucks! And the cunning part of all this was Fox had a lock on the essential technology. All of it! He had invested in exclusive rights to key methods for recording sound optically on film (marketed as Fox Movietone). He had already perfected his mobile, sound trucks. He owned the company which would make the new, 70mm film, camera heads. He owned the company which would make the projectors. He even owned the only machines for cutting sprocket holes in 70mm film stock! He had tested it all, in modest productions, and it all WORKED! All he needed was a blockbuster film to introduce his Grandeur to the world. He assigned Raoul Walsh the task of making "The Big Trail" -- depicting the struggles of a wagon train of Missouri settlers, traveling along with a cattle drive -- blazing a path together from the Mississippi River to the wild country north of Oregon. This was to be a MASSIVE location shoot, filming real locations almost from end to end. Everything was geared to show off the glory of widescreen filmmaking. There were no matte paintings in use. When you saw scenic vistas with wagons and cattle and settlers and indians filling the screen from side to side and way WAY out into the distance, those would be REAL scenic vistas and REAL wagons and cattle and extras. 20,000 extras, including nearly a thousand real indians from 5 separate tribes. Nearly 2 thousand head of cattle. 1,400 horses. 500 wild buffalo (a Federally protected herd). When the script called for them to film the covered wagons fording a stream, that's exactly what they'd shoot. No models. No camera tricks or shortcuts. It was all going to be the real thing! And they would ALSO produce the film in 4 languages (English, French, German, and Spanish). Since audio dubbing techniques were not developed yet -- heck, audio recording itself was still not really practical, particularly for shooting on location -- the film would actually be shot in 4 separate versions simultaneously. With 4 separate casts of principal actors and 4 Directors -- since of course the English speaking cast couldn't be expected to speak the other languages. So you had 93 principals on location! And they would ALSO shoot the film in "normal", 35mm 4:3 as well. Sometimes with the separate camera shooting simultaneously (with the 70mm camera being given the better angles of course), and sometimes with the scene reshot for the 35mm camera. That 35mm film would need to be edited separately as well. Simply put, they were going to make 5 versions of the film, simultaneously. Which called for a production staff of 200 including 22 camera operators. All told the location shoot spanned 7 states. The production alone -- not counting the investment in the new, 70mm technology -- cost $2M, back when $2M was a LOT of money. Fox planned to spend even MORE money subsidizing the introduction of 70mm into the finest movie palaces across the country. Seeing his Grandeur version of the film would be THE major event in each city, akin to seeing a major stage production. The 35mm prints, on the other hand, would go to the theaters in the sticks, whose owner's would just have to swallow their frustration -- unless they were willing to pony up the 70mm conversion costs on their own! Those costs would be new projectors and the new, wider screen. The cost of converting a theater to 70mm was significantly greater than converting a silent film theater to show talkies. And any OTHER studio which wanted to get in on the action would have to license ALL this technology from Fox! There was only one hitch. The film was shot in 1930, just after the stock market collapse -- just as the Great Depression was really starting to bite. And William Fox had paid for all this on credit. When it came time to release the film, Fox could only afford to convert two theaters: One each in New York and Los Angeles. Everybody else had to see the Academy ratio version -- which lost all of the impressive expanse of Walsh's widescreen composition. The film was a financial disaster for Fox and his studio. He lost control of the studio that very year, and a few years later his studio was merged with the upstart 20th Century Pictures, making 20th Century Fox. As for Widescreen filmmaking itself, it was knocked back on its heels and wouldn't return -- as Cinemascope -- for another 20 years! (And even then, only because the studios got into a panic over the impact of television on their box-office.) The technology, still owned by 20th Century Fox, would come back as the Todd-AO Process. "The Big Trail" is also notable for a couple other items. First, it includes the first starring role for a California college football jock, turned film studio prop boy, by the name of Marion Morrison. Or, as he would be credited in the Titles, John Wayne. Second, the film is a classic example of silent filmmaking trying to evolve into modern sound filmmaking. One of the principal supporting actors, for example, is Tyrone Power, SENIOR, in his only sound film role. His background of stage and silent films had led to a style where, let's say, "underacting" was simply not in his vocabulary. And his performance is just ONE example of the, umm, melodramatic style of a lot of the acting and scene structure. The filming also includes the silent film cliche of under-cranking the cameras to speed up action sequences. So you have the fascinating sight of John Wayne, supposedly bouncing up and down on a galloping horse during the buffalo hunt, looking like he and the horse are strapped to a paint can mixer. The film DOES have truly epic proportions. It is almost a documentary of traversing the Old West. As the Commentator points out, in 1930 there were still people alive who had LIVED through all that, and many of them had gone to Hollywood looking for work! So you have the cliche scene of circling the wagons for defense against indian attack actually being done "right" -- i.e., with each adjacent wagon overlapping the wagons on either side to provide better defense and more shooting angles -- rather than end to end as typically shown in films. This was something they could DO on this film simply because the production had SO DARNED MANY wagons in train! The plot, and the acting, are definitely "quaint" to say the least: Silent film-style hokey. Sure, there's a LOT of fun to be had, seeing Wayne in his first big role, and also seeing various examples of silent film style, ported into a talkie. But to be clear, the REAL marvel here is the spectacular, widescreen cinematography! Which, given the film's epic flop, only a few people in the world ever had a chance to SEE until this came back out on SD-DVD disc in 2008! The PQ and AQ on this Fox Blu-ray transfer are mixed quality. The film elements for both the 70mm, Grandeur widescreen and the 35mm Academy ratio versions show significant and pervasive scratches. However, for the 70mm version there are almost no signs of friction thinning, warping or tearing, which means the image is VERY stable both for geometry and gray scale level, and your mind soon ignores the scratches. Raoul Walsh's widescreen composition comes across very well indeed. (It's patently obvious why the Academy version flopped, as EVERYTHING about this film was staged and composed to show off the widescreen version.) Black levels are decent, and detail in long and medium distance shots is surprisingly good -- something you can actually SEE in this HD transfer for Blu-ray. The 70mm cameras and lenses they were using were not capable of focusing well for closeups. So there are few closeups, and the resolution drops noticeably when those appear. AQ doesn't fare as well (despite this being a lossless Mono track). Keep in mind the whole concept of shooting sound on location was still brand new. The actors had to be pretty static during the dialog scenes because they had to concentrate on projecting towards the mic location. I.e., yelling. Sound effects are elementary at best. And the recording quality sounds distinctly aged. If you have an Academy Equalization filter handy in your sound processing setup to tame the excess treble, plan on using it. You also might want to use the Subtitles. I recommend you play this disc in a Mono or Stereo speaker configuration. Expanding it into Surround speakers will not work well. The film historian's Commentary is excellent, and the Extras (ported over from the prior, SD-DVD disc) are also above average. See the sidebar above for details. In this day and age it's hard to conceive the chutzpah of Fox, spending all this borrowed money on a scheme to corner the market in what he felt sure would become THE dominant filmmaking technology. The Commentary and Extras do a good job putting all this in context. And of course the impact of this film on the careers of John Wayne and Raoul Walsh is also explored. I enjoyed this one tremendously! Part of its charm IS, of course, the very hokeyness of its melodramatic, silent screen style. But the widescreen spectacle is so darned good it is astonishing! And the very fact of its existence at all -- filmed on location, just 3 years into the sound film era -- is truly astounding!